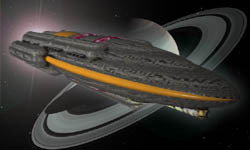 The Ghor Mal Heavy Cruiser was one of the last of the “super cruisers” built before the development of fusion drives. The Ghor Mal shares the same basic spaceframe as the Lofuran Super Tanker. The size and volume afforded by the Lofuran’s hull structure perfectly suited its conversion into a ship of war. Ghor Mal Heavy Cruisers were equipped with two HET lasers, one firing forward and the other firing aft. A battery of secondary railguns completed the ship’s armament. Tactically, the Ghor Mal suffered from a glaring blind spot in its aft protection coverage, but considering the nature of Courata military engagements of that period it was not considered a fatal flaw. Heavy cruisers of this type were used to fortify Courata battle lines, providing supporting fire for the smaller but more numerous dreadnoughts. The Ghor Mal’s ability to direct HET laser fire to the aft quadrant was seen as a major advantage, one few other ships could claim. The development of fusion drives and the discovery of hyperspace eliminated the role of the heavy cruiser. Bulk fuels were no longer required to provide long-range cruising capabilities and smaller ships could have more of their mass diverted into improved armor and weapons rather than fuel storage. Ships of this class remained in house service until the 1790s when the last of them were sold off to mercantile firms or exported to Courata client states.